One of our local Presbymergent churches is hosting a fundraising concert, since it is "not about guilt and obligation" and is trying to figure out new ways to funds our operations than, you know, passing the offering plate. at 1741 N. Western Ave. Historically, to pay rising rents in neighborhoods that were filing up with people moving north in the Great Migration, folks would ask a few musician friends to play in the living rooms of their apartments, asked a few other friends to make some food and mixed up a little gin in the bathtub. Charging admission at the door generated cash to pay the rent and a party whose celebratory energy burst from the intimate setting for all comers. Rent parties were a quintessential example of communities of people joining together to work towards mutual benefit. 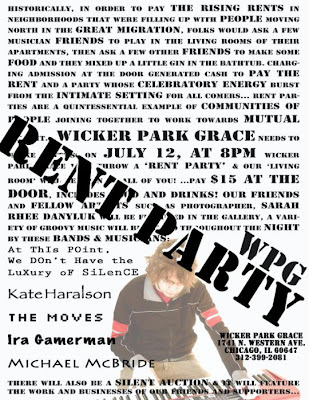 Wicker Park Grace will carry on this historical tradition on July 12th with an evening of music & art, food & drink, conversation & dance. If you can't come, you can still contribute to the effort here.